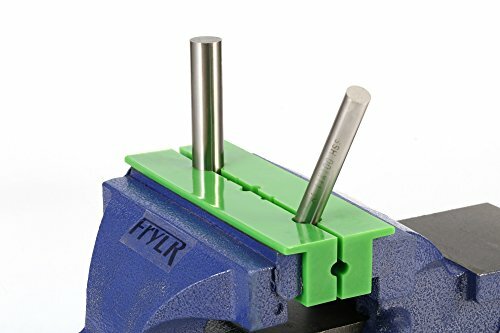 Frylr 6'' Magnetic Multi-Groove soft Vise Jaws/Vice pads (1:5'' 8''1.5'', Green) TPU rubber/hold and protect round, hexagonal, or serrated parts. View More In Bench Clamps. Magnetic Soft jaw pads are a great way to securely hold your polished or finished metal round stock without the risk of being damaged or leaving marks or scratches. Perfect for holding tubing or non-tapered riffle barrels when you need an extra hand. The Jaw will easily fit into any workpiece and stay firmly with. Our Jaws are hard enough to hold workpiece and also soft enough that keeps away your items from being damaged and from scratches. Highly compatible which Equalize pressure on independent pistons and can compensate for variations in workpiece size. Ours vise jaws are highly durable which is made of TPU rubber and are very useful to protect fragile parts from being damaged and suitable for holding irregular shapes also. Extra thick soft jaw body for added strength and magnets for superior hold with th great holding power. If you have any questions about this product by Frylr, contact us by completing and submitting the form below. If you are looking for a specif part number, please include it with your message.